Or Netflix (NFLX). 45% of all American households now subscribe to its video service. Selling subscriptions is a wonderful business model. Instead of charging a one-time fee, a subscription business collects constant streams of cash from customers. Think about this: More than 57 million Americans have agreed to let Netflix take $10.99 directly from their bank accounts every single month. This is an incredible financial advantage. No other business model can match the big, predictable cash flows that a well-run subscription business can generate. Netflix’s monthly charge is small enough that many folks barely notice it. Yet since 2013, it has added up to $37 billion in revenue… propelling Netflix to a 2,600% gain. Of course, subscription services are nothing new. But they’re exploding lately thanks to cloud computing. As a refresher, “the cloud” gives businesses cheap access to powerful supercomputers. Businesses can now utilize Amazon’s servers, for example, for a fraction of the price of buying their own. This may not sound like a big deal. But in fact, cloud computing has unleashed a whole new class of subscription-based businesses. I call these autopilot stocks—because they rake in cash month after month, as if on autopilot. 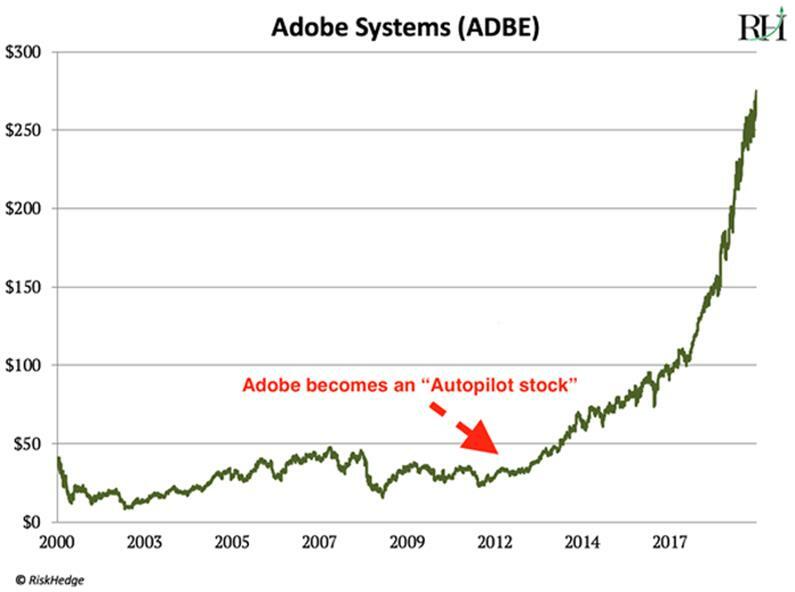 Consider Adobe Systems (ADBE). Its “PDF” files are the standard way to view most documents online. It also makes the image editing software Photoshop. Practically everyone with a job has used Adobe’s software. Yet from 2007 to 2012, its business stagnated. Sales stopped growing, and its stock was dead money from 2000 to 2012. Like most other software companies, Adobe sold its computer programs on physical CDs. But in 2012, it made a change. It decided to stop selling one-off products and began selling subscriptions to its computer programs. Instead of selling CDs, it asked customers for $30 a month to access its programs on the cloud. Prior to the cloud, Adobe had to persuade customers to buy an updated physical CD every few years. Now customers pay $30/month automatically, every month, unless they cancel their subscription. Switching to a subscription model was like a shot of adrenaline right into Adobe’s veins. Its net profit has surged 170% in the past five years. And its net profit margin has jumped from 19% to 25%. Adobe’s profits are growing faster than ever today. Ever use TurboTax to file your tax returns? Or QuickBooks to keep your finances straight? Intuit makes both products. Just like Adobe, Intuit used to sell physical CDs. As you probably know, tax and accounting rules change all the time. So every year, accountants and tax preparers had to buy a whole new set of CDs to keep up with the new laws. And as you can imagine, this cost Intuit billions of dollars. Every year it had to pay for shelf space… to manufacture CDs… to ship CDs… to design packaging. Not to mention, it had to hope customers wouldn’t switch to a competitor's cheaper software each year. 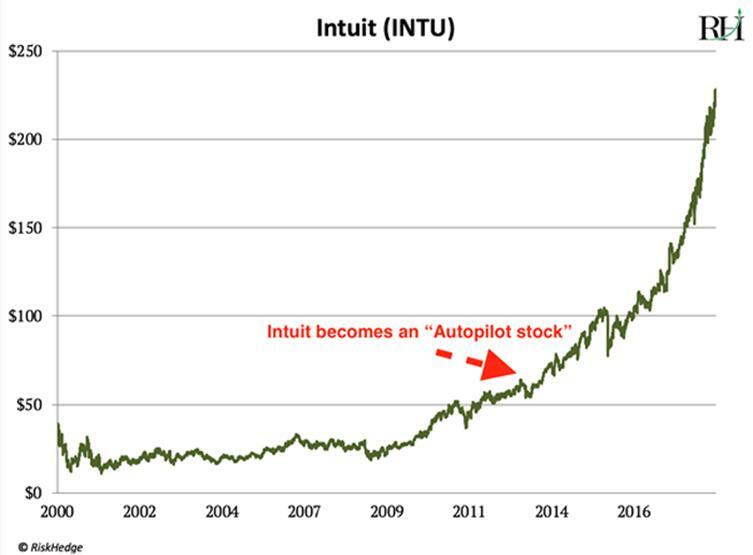 From 2006–2009, Intuit’s revenue climbed 35%. But because it was dumping so much cash into operating costs, its net profit rose only 14%. Who Will Be the Next Winner in Subscription Business? YouTube could be the next mega-hit subscription business. It is owned by Alphabet (GOOG—formerly known as Google). YouTube makes most of its money selling ads. But it’s just starting to dip its toe into the subscription waters. It launched YouTube Premium earlier this year, which includes ad-free viewing. This could be the beginning of something really big. You see, YouTube’s user base is mind-bogglingly huge—1.9 billion people use it every month. That’s more than one in every four people on planet earth! And it’s 15x larger than Netflix’s celebrated subscriber count. If YouTube can convert just 5% of these users to Premium… at $11.99 per month… it’ll earn $13.7 billion a year. With that kind of revenue YouTube could easily be a $150 billion company on its own. Yet because YouTube is tucked inside GOOG, investors don’t pay it much attention. A few weeks ago, I explained how its self-driving Waymo cars are light-years ahead of the competition. Longer term, I think Waymo could be a subscription service, too. Ridesharing services Uber and Lyft are already experimenting with this model. Can you imagine the profits to be made by combining self-driving cars with the superior economics of a subscription model? I want to own Google stock. But it’s still a bit expensive, so I haven’t bought it yet. As I mentioned a few weeks ago, I’m waiting for it to dip to around $1,050/share.